Annette Funicello was an American actress and singer. Funicello began her professional career as a child performer at the age of twelve. 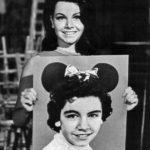 She rose to prominence as one of the most popular Mouse keteers on the original Mickey Mouse Club. As a teenager, she transitioned to a successful career as a singer with the pop singles “O Dio Mio”, “Tall Paul” and “Pineapple Princess”, as well as establishing herself as a film actress, popularizing the successful “Beach Party” genre alongside co-star Frankie Avalon during the mid-1960’s. "Of all the roles I’ve played, none has been as fulfilling as being a mother." "In 1993 my birthday present was a star on Hollywood’s Walk of Fame." "When you are young and healthy, it never occurs to you that in a single second your whole life could change." "Whatever dreams I have wished have come true." "As I travel across the country speaking about MS, perhaps I can offer others comfort and hope." "I have always thought of Walt Disney as my second father."